Looking for a special Christmas gift for the embroiderer in your life? Also see our Christmas Embroidery Thread Packages for your holiday-themed embroidery projects! Embellish just about anything with Swarovski® hot-fix crystals using the BeJeweler Pro! 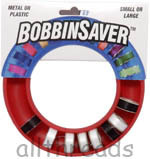 A convenient place to store all your bobbins! Featuring a beautiful selection of 100 thread colors and a FREE wooden thread storage rack, this is one of our most popular Christmas gifts. and let them pick what they want! Also see our Specials and Complete Catalog to be sure you don't miss anything!